ArborSystems launched its new direct-inject chemical product, Retriever Insecticide. Designed for use in the Wedgle Direct-Inject Tree Injection System, which is a no-drill tree treatment system, the insecticide is for tree injection applications to ornamental or non-bearing fruit and nut trees. Retriever contains the active ingredient Acetamiprid and is formulated to translocate in the tree’s vascular system when injected. ArborSystems’ chemicals are used with their Direct-Inject Tree Injection System as an injection into the flare or base of the tree to ensure even distribution through the tree’s vascular system. It places the chemical deep into the active areas where it can be easily absorbed, the company said. 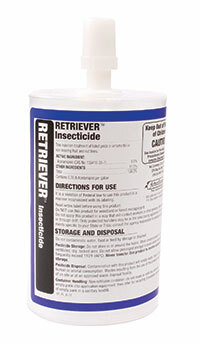 Retriever Insecticide is available in 120- and 1000-milliliter Quick-Connect Chemical Packs.